Hello and a very happy Tuesday to everyone. This week we're working on sketch #454 over at the Tuesday Morning Sketch challenge and it's an easy one too. The prize this week is a bottle of Nuvo Crystal Drops in the color of Red Berry. Thanks for stopping by and make it a great day whatever you do! CUTE and pretty card! Love the PB image. Great job on the Nuvo's on the card base. I always seem to mess those up when I put them on a card. So cute hedgehog!! Love the brown and pink combo, I think it's so elegant and classy, and with your embossing and drops your card looks delightful! An adorable card Carol, such a cute image. Carol, this is so darling. I just love the little Hedgehog licking the cone That cone looks so yummy too. Your coloring is wonderful! What a delight this card is, a wonderful image, with great embossing and background. Love the take on the sketch. Wow another extreeeeeemly cute card Carol. I love the texture from your Nuvo drops to dry embossing! Great job!! Absolutely adorable! 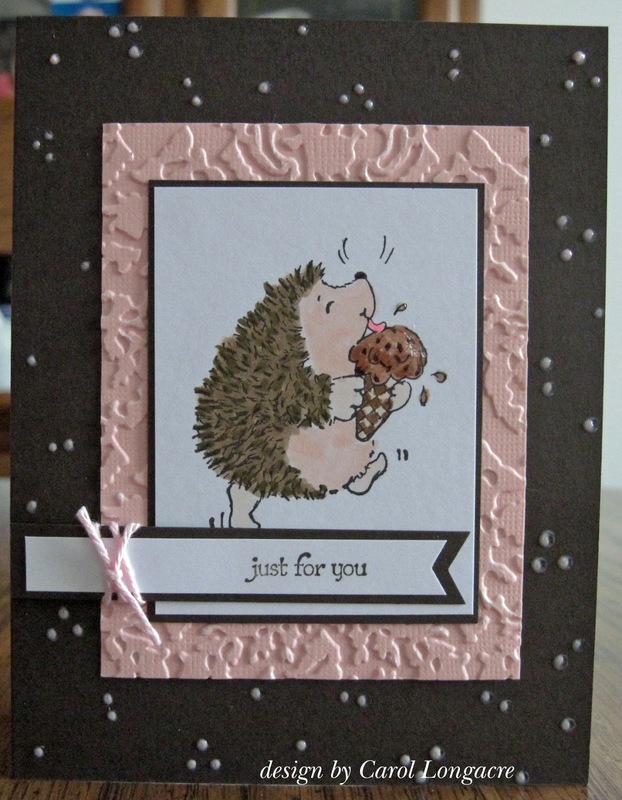 I love hedgies and this color combo. Cute Carol, and You KNOW that I like the colors!